Baked Spaghetti Casserole is a dish you won’t want to miss. If you love lasagna, you are going to love this casserole. It is easier to prepare than lasagna and tastes just as good. We will fill with this with ricotta cheese, so it is wonderfully creamy and crowd-pleasingThrown Together Baked Spaghetti Casserole. I personally love lasagna, but at times I find it difficult to make. Baked spaghetti casserole is easy to make, and it tastes very similar. This recipe is also very flexible; you can add more mushrooms, onions, or even green bell peppers to this if you like. It’s entirely up to you, its your casserole. I have made this recipe with bucatini and angel hair pasta. Bucatini is shaped like spaghetti, but the noodles are hollow. I like to use angel hair pasta when I am in a hurry because it cooks most quickly. You can use any pasta, this recipe is very flexible. You can use what you have on hand. If you want to go low carb pasta, you may want to try a low carb or even a whole wheat pasta. I often like to cook ahead on the weekends for the week. This is the perfect casserole for this reason. This reheats very well. If you want to reheat this dish later before baking it, make sure you use eggs that have already been pasteurized in case you are concerned about the raw eggs. They partially cook when you combine them with the pasta, but we should always be safe. You can make this recipe with 1 type of meat if you desire. I like to use the mixture of the Italian sausage and ground chuck because it gives a more rich flavor. Again, you can substitute, you could even go for light turkey sausage, and that will taste splendid too. If you can’t find, and Italian cheese blend at your grocery store mozzarella works very well. If you have some leftover vegetables in your pantry, you could easily add a little zucchini or carrots for a nice change. 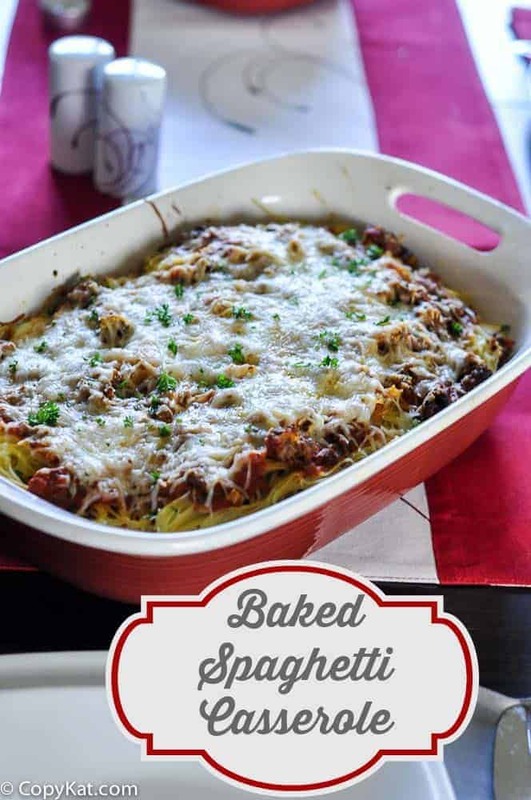 Baked Spaghetti is so easy to make! Bring a large pot of salted water to boil for the 12 ounces of pasta, and cook according to package directions. Reserve 1 cup of water for the casserole once the pasta has finished cooking.Preheat oven to 350 degrees.Saute together ground chuck and italian sausage. Cook over a medium high heat. Season with salt and pepper. While the meat is cooking chop onion and mushrooms and add to the pan. When the meats have cooked thoroughly remove from pan, and drain excess oil if necessary.Place pasta into a large boil and combine with 1 tablespoon of olive oil, 2 beaten eggs and 1 cup of Parmesan cheese. Stir will to combine all ingredients.Place pasta sauce into a large bowl with 1 cup of water. Stir to combine. You will create a thin sauce.Pour a couple of ladles of sauce in the bottom of a 13 x 9 inch baking dish. Add just enough sauce to cover the bottom of the pan. Add half of the cooked pasta to the pan. Spoon ricotta cheese of onto the spaghetti. Add in small dollops it will melt while cooking. Spoon half of the meat mixture onto the ricotta cheese. Add about 1 cup of Italian blend cheese on top of meat mixture.Cover meat with just enough sauce to cover the meat. Add the remaining pasta, and then top with the remaining meat. Add about 1 cup of Italian blend cheese. Bake at 350 for about 25 minutes. I love your recipes and direct friends to your site. And most of all they are easy and delicious. My husband just asked me to make my Chicken Scampi but it’s Copykats!! ???? Thanks!! I love your recipes and direct friends to your site. And most of all they are easy and delicious. My husband just asked me to make my Chicken Scampi but it’s Cooykats???? Thanks!! Aww, thank you very much. Looks great , can I use the pre-cooked lasagna instead of spaghetti. Will b making this on tues. thank you , love these recipes that r not out of reach. Thnx. I would make about 3 different batches. I would cook them all in individual pans. Do you have a larger pan? If so, let me know, and I will try to convert the recipe for you. Thank you for the delicious recipe and so easy to make. I wasn’t sure when I would ever get to make a lasagna dish, and this was good enough for me and my family. I substituted the red meat for ground turkey meat. The rest I followed the instruction. Thank you. These video’s are fantastic. I love the recipes because the ingredients aren’t to extravagant. Thank you very much. I try to do recipes for real people. You can’t be great all the time! Just found your site and have looked at many recipes that I want to try. As far as I am concerned, your directions are clear and easy to understand. Can t wait to go grocery shopping and then home to cook! Thank you! I don’t see any mention of the mushrooms, seasonings, or bacon in the directions. What do you do with them? If I were Stephanie I’ll tell you what to do with the mushrooms seasonings and bacon. Thank you Carl. Your comment was helpful but you also might notice this comment was made 3 months ago and apparently she revised the recipe to include instructions for those ingredients. Pat you are right. I made an error and later corrected it. This looks wonderful. Something I’m going to try for sure! Stephanie, I appreciate all the work you put into this website. You provide so much good information and really tasty recipes. Thank you very much! I appreciate your kind comments. This is spectacular, I love casseroles like this. I want to dig right in there. Thank you very much! You are very kind! Why don’t you FIX YOUR RECIPE so the directions reflect the ingredient list. This is very sloppy on your part and does not inspire confidence in your recipes.